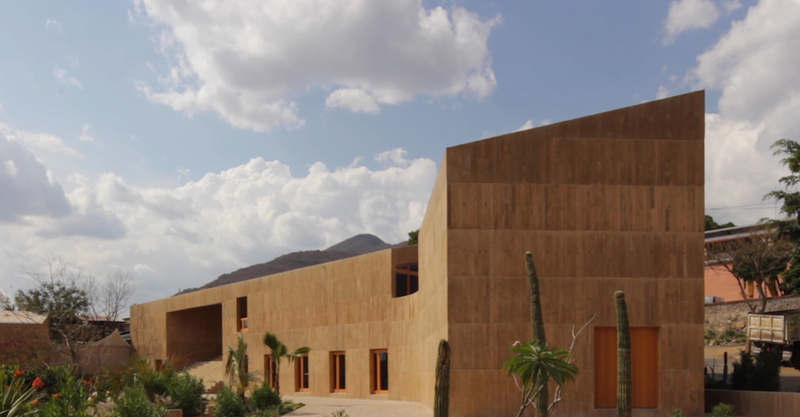 The new Community Cultural Centre was designed in 2017 by PRODUCTORA for Teotitlán del Valle, a village in the Mexican state of Oaxaca. The centre hosts the Teotitlán Museum of History, created with the purpose of hosting an exhibition of the archeological and textile wealth and tradition of the area, and its spaces have also become the home for the Municipal Library and a service area. Built using locally-sourced material, such as concrete, timber, clay tiles and bricks, the Cultural Centre appears to blend with the landscape, its palette of colours variation of sandy tones. Now a video by Juan Benavides explores its interiors and the context. The two volumes composing the complete structure (the first, facing the village, is the house of the Museum, instead the second contains the Library), occupies only a fifth of the area of the cultural centre, leaving a large public space of plaza and gardens, improving the pedestrian routes passing across the site and creating connection with the main square, becoming a new pulsing heart for the village, connecting innovation and heritage. The short film by Juan Benavides starts from the interaction between nature, surroundings and built area, showing how closely PRODUCTORA worked to create a Centre Cultural capable of blending with the landscape and providing new services. The choice of materials and shapes was, in fact, determined taking into consideration the adverse climatic conditions: for example the "controlled openings create a passive system that helps to regulate the temperature inside the building and provides users with a comfortable space, with no need of air conditioning", as an article on Domus correctly pointed out. Long shots are devoted to the interiors of the building, which, for its quiet darkness and for its majestic stairs and windows, somehow resembles a church. For some extent a museum and a library are a church themselves: a place for gathering, meditation and reflection, a place everybody is able to call home. Outside, the plaza facing the building is crossed by pedestrians and filled with music (all the soundtrack for the video is provided with a mix of city sounds and original scores) coming from artisanal shops, confirming this new addition as a perfect fit for the village. Sharp lines and the innovative structure of the building are accurately captured through the perceptive eyes of Juan Benavides, a director capable of comprehending the architects' vision and its realisation.